Brady and Alex White enjoy watching the combine on a sunny fall day. 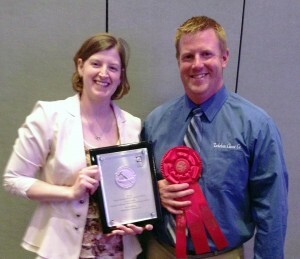 Lindsey and Jamie White proudly display new World Champion Cheese awards. Our cheese making facility, located in Lena, Illinois, was built by William Thill in 1973 and was originally called Excelsior Cheese Factory. 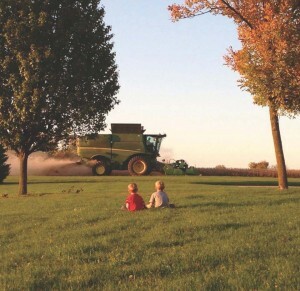 Duane and Cheryl Torkelson bought the property from Mr. Thill back in 1985 and started Torkelson Cheese Co. To continue the growth of the company, Duane and Cheryl partnered with Jamie and Lindsey White in 2008. Over the years, the Torkelsons and Whites have made many changes to the factories. A successful growth pattern has included increased storage capacities, modernizing the packaging process, enhancing our cheese making, and most recently, the completion of a new lactose production facility.